Building on a hobby to make it a source of living so that the line between work and play gets blurred is a fantastic dream that anybody would love to realize. But few will give such a dream whatever it takes to make it a reality. 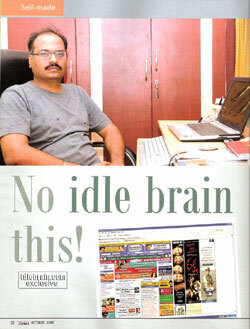 Jeevi, nom de plume for G.V.Ramana, the brain behind idlebrain.com, has done it with aplomb in just over seven years. A graduate of BITS, Pilani, Jeevi had short stints in software and finance firms before he launched a website to cater to the entire gamut of industry and audience needs in Tollywood. 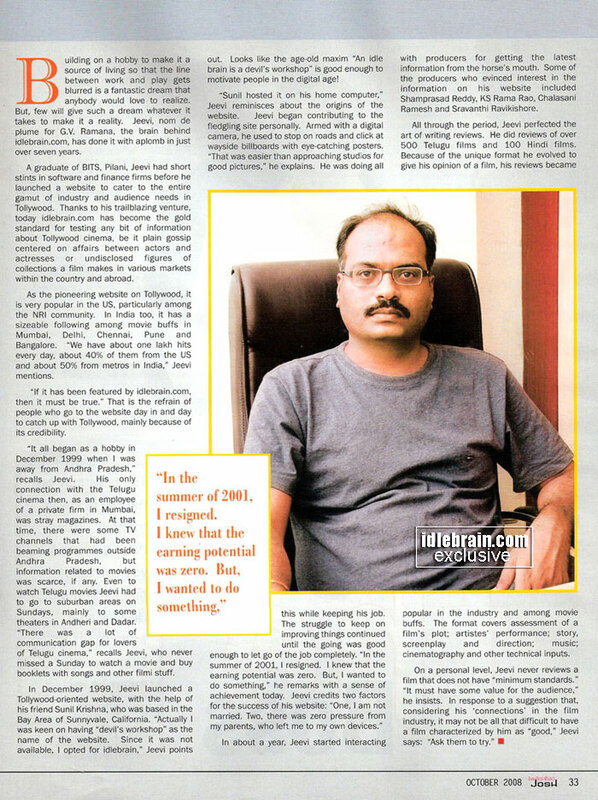 Thanks to his trailblazing venture, today idlebrain.com has become the gold standard of testing any bit of information about Tollywood cinema, be it plain gossip centered on affairs between actors and actresses of undisclosed figures of collections a film makes in various markets within the country and abroad. 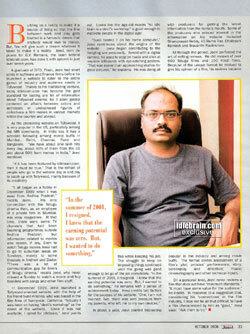 As the pioneering website on Tollywood, it is very popular in the US, particularly among the NRI community. In India too, it has a sizeable following among movie buffs in Hyderabad, Mumbai, Delhi, Chennai, Pune, and Bangalore. “We have about one lakh visitors every day, about 40% of them from the US and about 50% from metros in India,” Jeevi mentions. “If it has been featured by idlebrain.com, then it must be true.” That is the refrain of people who go to the website day in and day to catch up with Tollywood, mainly because of its credibility. “It all began as a hobby in December 1999 When I was away from Andhra Pradesh,” recalls Jeevi. His only connection with the Telugu cinema then, as an employee of a private firm in Mumbai, was stray magazines. At that time, there were some TV channels that had been beaming programmes outside Andhra Pradesh, but information related to movies was scarce, if any. Even to watch Telugu movies Jeevi had to go to suburban areas on Sundays, mainly to some theaters in Andheri and Dadar. “There was a lot of communication gap for lovers of Telugu cinema,” recalls Jeevi, who never missed a Sunday to watch a movie and buy booklets with songs and other filmi stuff. In December 1999, Jeevi launched a Tollywood-oriented website, with the help of his friend Sunil Krishna, who was based in the Bay Area of Sunnyvale, California. “Actually I was keen on having “devil’s workshop as the name of the website. Since it was not available, I opted for idlebrain,” Jeevi points out. 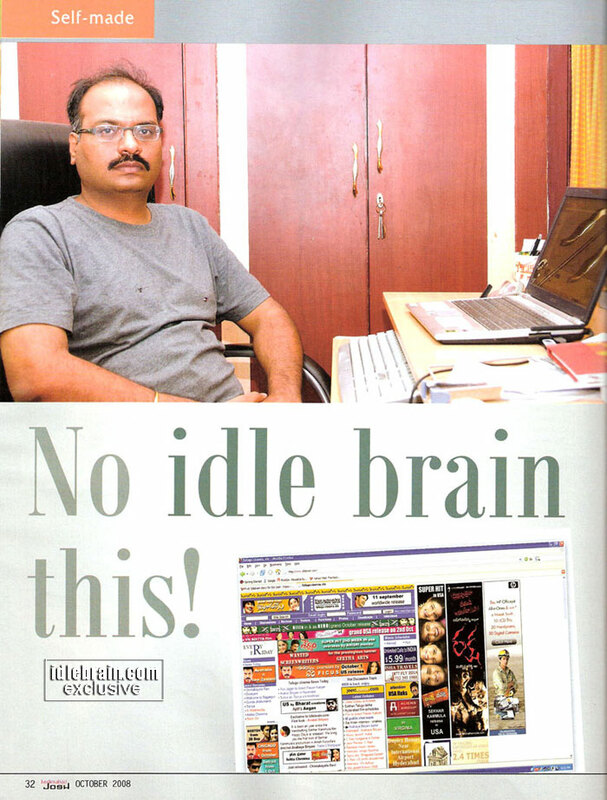 Looks like the age-old maxim “An idlebrain is a devil’s workshop” is good enough to motivate people in the digital age! In about a year, Jeevi started interacting with producers for getting the latest information from the horse’s mouth. Some of the producers who evinced interest in the information on his website included Shyam Prasad Reddy, KS Rama Rao, Chalasani Ramesh and Sravanthi Ravikishore. All through the period Jeevi perfected the art of writing reviews. 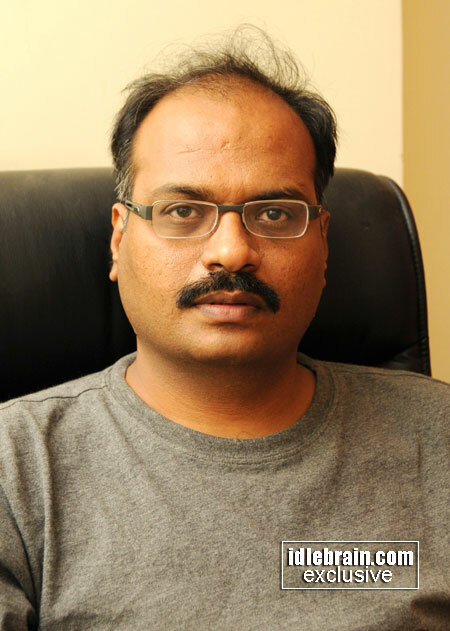 He did reviews of over 500 Telugu films and 100 Hindi films, Because of the unique format he evolved to give his opinion of a film, his reviews became popular in the industry and among movie buffs. The format covers assessment of a film’s plot; artistes’ performance; music; cinematography and other technical inputs. On a personal level, Jeevi never reviews a film that does not have minimum standards. “It must have some value for the audience,” he insists, In response to a suggestion that, considering his ‘connections’ in the film industry, it may not be all that difficult to have a film characterized by him as “good,” Jeevi says: “Ask them to try."